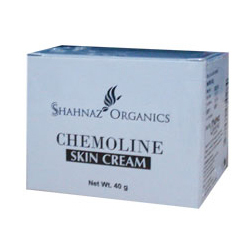 An ideal combination of advanced techniques and ancient organic remedies, this gentle, soothing cream has been specially created to deal with side-efects of chemotherapy and radiation on the skin. Containing plant oils and extracts like aloe vera juice, date, chironji, along with wheatgerm, olive, almond oils and honey, it helps problems of dry skin sensitivity, redness, peeling and flaking. It heals, soothes, protects and nourishes the skin providing intense hudration. Easily absorbed into the deeper layers, it improves moisture retention and restores health to the skin, making it soft and smooth. Apply on face and neck and leave on.